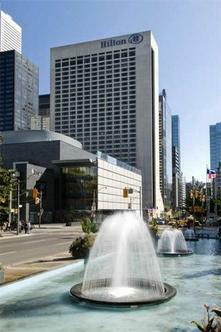 Spoil yourself with award-winning cuisine and a central location at the Hilton Toronto hotel, 10 minutes' walk from the CN Tower. Swim in the pool all year round or do business in meeting rooms with wireless internet access. Executive Room guests enjoy Lake Ontario views and a private boardroom.Guests can indulge in aperitifs in Barristers Bar, sizzling steaks at Ruth's Chris Steakhouse or award-winning Canadian cuisine at the TUNDRA Bar and Restaurant. Relax at the sauna, pool or candlelit bar. Toronto attractions are nearby - from the Four Seasons Performing Arts Centre to the CN Tower, Harborfront and Toronto Islands. A subterranean walkway leads to over 1000 shops.The hotel is 10 minutes from the Canada Life Building and features 19 meeting rooms for 10-1000 people, a business center and Executive Lounge. From Hilton Guest Rooms to Suites, all rooms have city views and contemporary decor. Executive Rooms and Suites also have Executive Lounge access.